Do New Competitors, New Customers, New Suppliers, ... 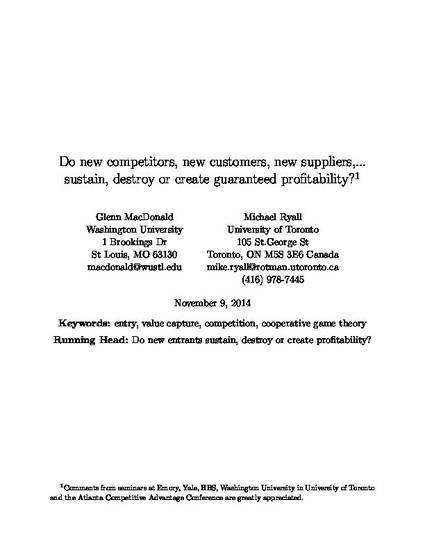 Sustain, Destroy or Create Competitive Advantage? We examine the effect of entry on the value appropriated by an incumbent. By ``entrant’’ we mean at any level of the value chain — from raw material suppliers to buyers. Our specific concern is whether competition guarantees the incumbent some positive minimum level of profit. We demonstrate that the net effect of entry is subtle — even when the entrant is a perfect imitator. On the one hand, entry typically results in greater value creation. This tends to soften competition and, thereby, lower the incumbent’s minimum level of appropriation. At the same time, however, entry also creates new competitive alternatives for the existing agents, which tends to have the opposite effect. We contribute to a growing stream of strategy theory based upon coalitional game theory. We say a player has "competitive advantage" if the player's minimum equilibrium appropriation is strictly greater than the player's outside alternative. That is, the forces of competition alone, as embodied in the conditions defining equilibrium, suffice to guarantee a player appropriates more than the best alternative to being in the game, i.e., a sustainable performance advantage. When a player has competitive advantage pre-entry, but not post-entry, we say entry "destroys" competitive advantage; likewise for "creating" and "sustaining" competitive advantage. Our results provide complete characterizations (i.e., if and only if statements) of the features of a game that cause the addition of a new player to destroy, create or sustain competitive advantage in a general coalitional game. These results are of importance for strategy issues since -- as argued by proponents of value-based business strategy, e.g., Brandenburger and Stuart (1996) -- many of the economic interactions of interest in strategy are well-described as coalitional games.